Gunfight at OK Corral (1957), directed by John Sturges; Tombstone (1993), directed by George P. Cosmatos. This legendary reckoning between the Earps and the Clantons was a lot more ambiguous than portrayed in these films, it didn’t take place at the OK Corral, and it only lasted 30 seconds or so. Tombstone is a lot closer to historical fact than John Sturges’ 1957 effort, yet it takes a fair while to get going, and somehow lacks the cohesive force of the earlier film. 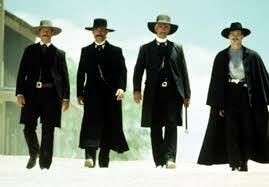 Kurt Russell is a stout and steely Wyatt Earp and Val Kilmer (who has the best lines) is impressive as consumptive card-sharp, gunslinger and retired dentist Doc Holliday. Earp has done his violent tours of duty, cleaning up Dodge City and so on, and hankers for a quiet life of commerce and recreation. Why not, therefore, settle in a town called “Tombstone”? His brothers are there and for a good chunk of the movie, we see them sampling life’s pleasures, going to the theatre, playing cards, dancing with the ladies, all the while ignoring the fact that the Clanton-led “Cowboys” treat the place as their own squalid fiefdom. Eventually, elder brother Virgil leads by example and pins on a star (soon, he won’t have two hands for this task) and the trouble begins. All in all, this is not a bad film but it doesn’t resonate quite like the classics of the genre, such as The Ox-Bow Incident (1943) Red River (1948), High Noon (1952), Shane (1953), The Searchers (1956), The Good the Bad and the Ugly (1967), The Wild Bunch (1969), or an earlier OK Corral emanation, My Darling Clementine (1946).